Mega backdoor Roth is catching on! Several readers emailed me saying their employer added non-Roth after-tax contributions and allowed converting to Roth within the plan (officially known as an In-plan Roth Rollover). I didn’t ask but I don’t suppose they all work for the same employer. Some plan providers or consultants must be going to employers and persuading them to add these valuable features to their plans. At least one employer was specifically pointing out to the employees the advantage of making non-Roth after-tax contributions followed by converting to Roth within the plan. Even though they may not advertise it, some employers also allow rolling over the non-Roth after-tax contributions and earnings to a Roth IRA. Be sure to ask your plan administrator about it. When you have both options available — converting the after-tax account to Roth within the plan or sending it to a Roth IRA — which one should you choose? Before you consider either option, you should make sure you are able to choose to rollover or convert within the plan only from the after-tax sub-account (your non-Roth after-tax contributions and the earnings on those contributions). If the plan mandates that you must pro-rate between your after-tax sub-account and money from your other pre-tax sub-accounts in the plan, then you shouldn’t do it. The rest of this article assumes that you can choose to do it only from the after-tax sub-account. You must make that choice loud and clear to the plan administrator whether you are converting within the plan or rolling over to a Roth IRA. Either option is a good one. Between the two, in general I would favor taking it out to your own Roth IRA, for some minor reasons which may or may not make much difference to you. You have more investment options in your own Roth IRA. The investment options in your plan may be more expensive. However, some plans have great investment options. Some investment options in the plan such as a great stable value fund or institutional funds are better than the ones you can get on your own outside the plan. If you take the money out of the plan to your Roth IRA, you can withdraw before you are 59-1/2. You may have to pay some tax on the withdrawal but at least you have that option. See Mega Backdoor Roth and Access To Your Money Before 59-1/2. If you convert within the plan, the money is locked up until you reach 59-1/2, terminate employment, die, or become disabled. Of course if you leave your employer and you rollover the Roth 401k to a Roth IRA, you are able to withdraw before 59-1/2 again. If you don’t care about withdrawing while you are employed and before you are 59-1/2, then this doesn’t really matter. When you take the non-Roth after-tax money out of the plan, the IRS allows you to take the after-tax contributions to a Roth IRA and take the earnings to a traditional IRA. Some plans take advantage of this IRS rule and let you to do the split. This way you are not taxed on the earnings at the time of the rollover. When you convert to Roth within the plan, there is no such option. You will always be taxed on the earnings when you convert. A split rollover is an option. You don’t have to split but at least you have that option when your plan allows it. I prefer keeping it simple and just rolling over both after-tax contributions and earnings to a Roth IRA, and as a result paying tax on the earnings. If you rollover once a year, the earnings won’t be much. 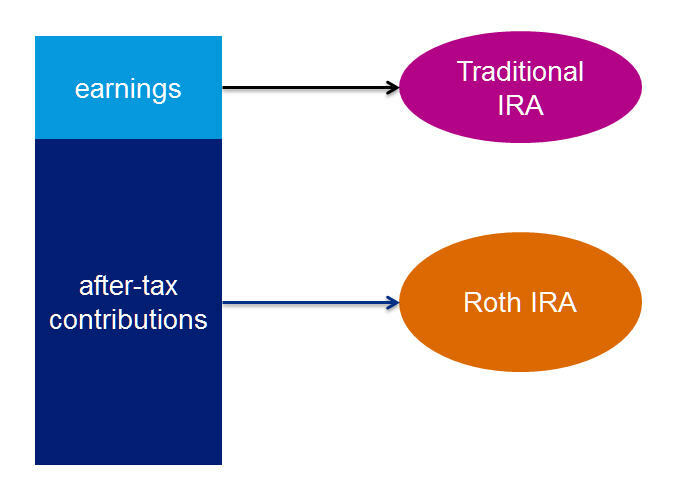 Sending the earnings to a traditional IRA in a split will interfere with your regular backdoor Roth. If you care about the regular backdoor Roth, you will have to roll the earnings in the traditional IRA back into the plan. I think it’s too much trouble for too little gain. However, if you run into a great year when your after-tax contributions generate a lot of earnings before you do the rollover, it may be worth it to jump through the hoops with a split. It’s your choice whether you invoke the split option or not when your plan allows it. If you don’t mind paying taxes on the earnings when you convert, again this doesn’t really matter. If you have a lot of earnings when you roll over the after-tax account to a Roth IRA and the value subsequently drops a lot, you have the option to recharacterize and pull the money out into a traditional IRA. After a mandatory waiting period, if the value doesn’t recover, you then re-convert the traditional IRA to a Roth IRA. This way you will lower the taxes you have to pay on your original rollover. That’s a lot of if’s but it’s an option. If you convert the after-tax account to Roth within the plan, you don’t have this do-over option. If you don’t have a lot of earnings to begin with, or if you choose the split rollover when you do have a lot of earnings, then this doesn’t matter. As you see, other than the investment options, the reasons that favor taking the money out to a Roth IRA as opposed to converting to Roth within the plan are mostly just-in-case. Either way works. If converting within the plan is more convenient or if it’s the only option available in your plan, by all means do it. Just make sure you convert only from the after-tax sub-account, not from your pre-tax sub-accounts. If you rollover to your Roth IRA, be sure to keep a journal of the transactions. See Maintain A Roth IRA Contributions and Withdrawals Spreadsheet. My employer has this option and is the major reason they do NOT offer a ROTH 401(k). You left one ***important*** item out. There has been no ruling or guidance yet (that I’m aware of) on whether traditional contributions (employee, employer, or even rollover funds) need to be prorated with the after tax intra plan conversion (i.e. same treatment of IRAs and backdoor Roth, but within a 401k). Given the risk involved in potential proration issues intra plan (at least with other traditional employee elective deferral balances), it’s just far safer to immediately roll out after tax for conversion. The question has numerous legal issues with different source types not only having different tax treatment, but also different status within the plan. Rollover funds can be available for in service distribution. Roth assets typically categorized as an elective deferral source not subject to in service and now you’re adding in converted after tax that was able to in service distribute. If the IRS rules proration of pre-tax they could mucky these rules up, but if they do nothing what happens if the Roth conversion funds are comprised of some after tax and some deliberately converted elective deferral? Could some of the elective deferral money be rolled out at a future date by accident with the after tax Roth converted money? I don’t think all of the above and more have been sorted out yet since this change was made. IRS released the following guidance in 2014 that addressed the pro-rata handling of after tax funds in 401K. Near the end I said make sure you convert only from the after-tax sub-account. I will update it to make it clear at the beginning that’s the premise of this whole thing: you can choose to convert only from the after-tax sub-account. If the plan doesn’t allow you to choose, then it’s not a viable option. Hypothetical: Let’s say an employer allows in plan rollover from after tax sub-account and from normal 401k, but allows you to pick which – are you sure you don’t have to prorate them for tax purposes? If the plan administrator allows you to pick, they are going to issue the 1099-R reflecting your choice, without checking that “taxable amount not determined” box. You go with the 1099-R issued. Nice writing – I learned a lot from the points . Does anyone know where my business can grab a sample IRS 1099-R document to complete ? The service provider for the plan will complete the 1099-R. Your business does not have to complete it, unless your business is actually providing plan administration services to 401k plans. I am doing my first year of mega-backdoor Roth via my 401k afterTax contributions. It is going better than hoped and expect to max out the $59K limit (I’m over 50). My main question and concern is whether my limit is $53K or $59K. I am contributing 5% pretax to get max match plus get profit sharing employer contribution, all this together totals about $13K. Will I be limited to afterTax contributions of $40K (53-13) or $49K (59-13)? In the 401k, there is a separate deduction percentage that can be entered for the catchup contribution. So my concern is if the payroll will shut me down at the 53K threshold since I have not specifically put in any preTax catchup. Been reading some of the IRS site info which indicates catchup contributions don’t kick in until you have max’ed the $18K pre-tax. I am just barely able to reach the 59K, so don’t want to suddenly find that payroll stopped the deduction. Plus, if they knock me off at 53K, I will likely lose several pays of company match. My choice would be to kick-in to max out the catchup portion sooner than later. Fidelity claims I can do after-tax up to the $59K total limit, but I am not sure if our payroll (thru ADP) understands this, and doubt they have encountered anyone doing this (I have tried to ask about limits). Most cases I read about on backdoors, they all seem to max out preTax first, like this article. Other background…my company is large, about 10,000 employees. The 401k does allow after-tax withdrawals and I have done several this year already into my Roth and earnings into trad IRA. I also made max contributions of $6500 each for my non-working wife and myself. Also maxing HSA and never spending it. Maxing ESOP (15% discount) and selling that to live on. Won’t be able to maintain contribution of $6500 to Roth beyond next year due to depleting savings. Trying to move savings into Roth before I hit 59.5 years(when backdoor ends), if I last that long. The catch-up has to be pre-tax or Roth (if the plan offers a Roth 401k option). In this link from the IRS, it states that it’s not allowed to rollover just the after tax amounts in your retirement plan to a Roth IRA. I would imagine the retirement plan includes all of the sub-accounts in the 401k. It only applys to 401k’s while you are working for the company that has it. When working, you can’t withdrawl your pretax money, so it can’t be pulled out on a prorata basis. Therefore, when you pull out after tax, the only earnings needed to be pulled are the earning attributed to the after tax money. After you leave the company, all funds are able to be withdrawn/transferred so the entire balance has to be taken in proportion. Plus, irs sent out a determination letter Fall of 2014 saying the transfer of afterTax to Roth and earnings to IRA is ok. You can roll the earning to the roth if you want to pay the tax now on those earnings…I have done this at times to max my tax bracket. Based on the IRS article that Craig linked to, Megamax does not appear to be correct. In the article, the IRS specifically addresses the question “Can I roll over just the after-tax amounts in my retirement plan to a Roth IRA and leave the remainder in the plan?” and says that in-service, non-hardship withdrawals MUST be pulled out pro-rata. > pro-rate between your after-tax sub-account and money from your other pre-tax sub-accounts > in the plan, then you shouldn’t do it. I’d like to share this article within my company to explain options to my coworkers, but I can’t do so when the article appears to be factually incorrect. Read very carefully. It only said “after-tax amounts” not “after-tax sub-account.” The earnings in the after-tax sub-account are pre-tax. It’s addressing a different question. “Can I roll over just the after-tax amounts [without the earnings thereon] in my retirement plan to a Roth IRA and leave the remainder in the plan? So then after partial withdrawals the usual employee tax-deferred portion CAN stay in plan without being affected by pro-rata rules; just be sure to also distribute the proportional amount of after-tax GROWTH on earnings, (taxable ultimately) correct Harry? Correct. The administrator will automatically include the earnings. You only have to tell them you want to distribute from the after-tax sub-account. I do backdoor traditional IRA conversion every year and my traditional IRA is clean. If I rollover the earnings from after tax contributions in 401k to traditional IRA then is the contribution to traditional IRA considered non-deductible contribution? Assuming this sits as cash in traditional IRA and no earnings I don’t need to do step#1 in IRA conversion steps? Please advise. It’s addressed in the split rollover section. The earnings are not non-deductible contributions. You would need to do Step 1 if you don’t want to pay tax on converting those earnings to Roth. I see. I might be missing something here. So let’s take an example. I have my after tax 401k funds in A1 (of course a sub-account under A1 to be precise). Let’s say that I have 2k in earnings on 10k after tax amount. I split it and move 10k to Roth IRA and earnings of 2k to Traditional IRA T1. Assume 2k sits as cash in T1. To do backdoor Traditional IRA conversion towards the end of year I do Step#1 and rollover 2k to 401k account A1. So this went full circle?. This 2k will sit in my account A1 as after tax rollover. Is this correct? Just trying to make sure. Correct except the very end. The 2k is pre-tax money. It goes into a pre-tax sub-account under A1. > If you care about the regular backdoor Roth, you will have to roll the earnings in the traditional IRA back into the plan. What plan are you referring to, the Roth IRA I presume? The 401k/403b plan where the money came from, or another 401k/403b plan you still have account with. If you are going to roll the earnings over to the Roth IRA after you do the split rollover, you might as well not do the split and roll over the entire non-Roth after-tax contributions plus earnings into the Roth IRA to begin with. Is there still a benefit due to the IRA withdrawal rules, where you could effectively order the after tax gain portion after the after tax contribution portion by converting from traditional IRA to Roth IRA later? If you don’t care about the regular backdoor Roth, because you are under the income limit or because after having done the mega backdoor Roth you don’t have additional money to contribute, you can certainly hang on to the earnings in the Traditional IRA until you retire and convert it when your tax rates are lower. If you still want to do regular backdoor Roth then I don’t see any point in doing the split rollover when you can’t move the earnings back into the plan. Why don’t more employers offer these options? Administrative burden? Plan compliance / HCE discrimination issues? All of the above. In an average large company, 30% of employees don’t even participate in the plan to begin with; only 10% of those who participate max out the annual limit. Introducing another contribution type requires payroll changes, explaining to employees, more administration and compliance requirements, discrimination testing, dealing with testing failure, all to give maybe 5% of employees more headroom. Unless that 5% includes executives but executives make so much money they don’t care about extra $30k. So we are only seeing this being added at companies with more higher paid employees. It does not interfere when you send 100% of the rollover directly from the plan to a Roth IRA, without a split or stopover in a traditional IRA. I have a roll-over IRA account which consists entirely pre-tax 401k money rolled over from my previous employer’s 401k plan. I also have a Roth IRA account. My current employer does offer after-tax contribution and roll-over to Roth IRA. In the future when I do this “mega backdoor roth” roll-over, and suppose I do a 100% roll-over without split, it will not interfere with my roll-over IRA as far as pro-rata rule goes. Is this correct? It seems the answer is “yes” from your article and the comments, but I just want to make sure. I don’t want to convert the roll-over IRA to my current employer’s 401k plan because the latter doesn’t have enough fund options. I’m essentially giving the regular “backdoor roth” option by keeping the roll-over IRA, but I’m going to live with that as long as it doesn’t hurt “mega backdoor roth”. Thanks in advance for your reply, and the article is really informative! That’s correct. When you can have mega, not doing the regular isn’t a big loss. Preparing for my first MBR conversion, does the deadline for 2017 contributions end with the calendar year or the tax year end like standard Roth IRA contributions? Like John I have a IRA account with 401k rollovers from previous employers. However I do not have a Roth account. So wouldn’t it be an advantage to convert after tax contributions to Roth option provided by my employer versus rolling it over to an outside Roth account which would subject me to the pro rata rules? My understanding if I were rolling to an outside Roth is I would first have to rollover to my IRA and then convert to a Roth exposing my IRA to pro rata rules but not sure if that is correct. That’s not correct. You can rollover directly from the plan to a Roth IRA without any interim stop at your traditional IRA. If you do it that way it does not trigger the pro rata rules. What happens if it is converted at a loss? Is the loss deductible? It’s not deductible, but more gains in the future will be tax free. Let’s say I did the mega backdoor rollover and paid the taxes on the gain. Is the amount considered principal in Roth IRA at the time of rollover? This matters because in an Roth IRA account the principal can be withdraw anytime without penalty. And to make it more complicated, my understanding is the tax is paid outside Roth IRA account. So is the entire amount considered principal, or just (rollover amount – tax) portion? Apologize if this has been answered before. Your article is awesome. The gain is not treated as principal. It’s subject to 10% penalty (but not income tax again) if withdrawn within 5 years of the rollover and before age 59-1/2. See Mega Backdoor Roth and Access To Your Money Before 59-1/2. I don’t think I have seen this addressed directly but maybe have in a spread out way through other questions. I requested a check from my after-tax sub account and my institution put it all in my traditional IRA account by mistake and say they can’t move it now. I plan to convert it to my roth ira and I am assuming I will still end up correct at tax time and only pay taxes on the earnings. It was a test run for more contributions. I plan to pay taxes every year and zero out my traditional IRA whenever I can to get everything in my Roth IRA. Moving forward, is it fine to send my entire sub-account after-tax monies & little bit of earnings straight into my roth IRA (no separate checks and I won’t mention my traditional IRA to my employer) and simply have a tax bill on the earnings? 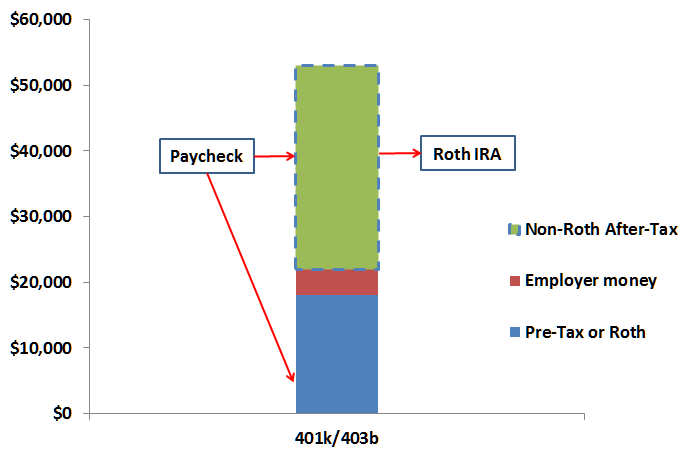 With all of the talk about splitting post-tax to roth and pre-tax to traditional IRA, I would convert it to roth a few days later regardless. I just don’t want to deal with the traditional IRA at all but didn’t know if it was a hard and fast rule to “stop” there with my earnings first. If your plan thought you were putting the money into a Roth IRA, the plan will generate the tax form showing the earnings as taxable. If you convert the money in the traditional IRA to Roth now, your IRA custodian will think the earnings are taxable again. So first find out when you requested the rollover from your plan, whether you indicated it was supposed to go to a traditional or Roth account. If your paperwork clearly showed it was going to a Roth, you need to have your IRA custodian really put the money into a Roth account. If they made a mistake they must own up to it and correct the mistake. If your paperwork showed it was going to a traditional account, and the money landed in a traditional account, now you can convert it if you have no other traditional, SEP, or SIMPLE IRAs. The first graph shows rolling over to a Roth IRA directly. It’s preferred in many cases. Split rollover is an option. It’s not required. Thanks for your response. I found my form and it does state that nearly all of it is after-tax. I think my issue came when I requested the check. It asked for my Roth and Traditional account numbers so I put all information in thinking “ok, they will cut two checks, one for each account.” I don’t recall specifying it as one or the other but will pay closer attention. They only cut me one check. They only put the traditional account number on the check which led to the confusion upon deposit. I will be submitting the documentation to my IRA custodian. Thanks for helping point me in the right direction. Thankfully this test run wasn’t with a lot of money. It is a great article and the series of articles that you have written on MBR are the most complete and comprehensive out there on the internet. There is only one question that I am not able to get a clear answer. When I do an in-plan conversion of my after-tax contributions, can I later in-service withdraw just my contributions (not the earnings) tax and penalty free. Or is it the case that my contributions are also locked in until 59-1/2. If I can not straight withdraw my contributions after in-plan conversion, can I roll it over to Roth IRA and then withdraw it? Thanks again for sharing your immense knowledge on this topic and your help is greatly appreciated. The general principle is that you are not able to gain distribution rights by moving money around. If the plan allows in-service distribution, without an in-plan Roth rollover, you would have to distribute the earnings on the after-tax contributions. By taking a distribution from the money that came from an in-plan Roth rollover, at best you would have to distribute the pre-rollover taxable earnings as well. By first doing an in-plan Roth rollover followed by a rollover to a Roth IRA, the rules would make it the same as originally doing an in-service distribution from after-tax to Roth IRA. In other words the pre-rollover earnings must be distributed and subject to 10% penalty within 5 years of the rollover. A plan may place more restrictions than the IRS rules. If you are interested in early distributions, it’s better to do the in-service distribution to a Roth IRA. I have my 401k at Fidelity and a personal Roth IRA at Charles Schwab. I can no longer deposit the annual limit to my Roth due to income being too high. So I can take after tax contributions from 401k at Fidelity and roll them into my Schwab Roth? Yes if your 401k plan allows in-service distribution from the non-Roth after-tax account. The earnings on the non-Roth after-tax contributions will come with the rollover. 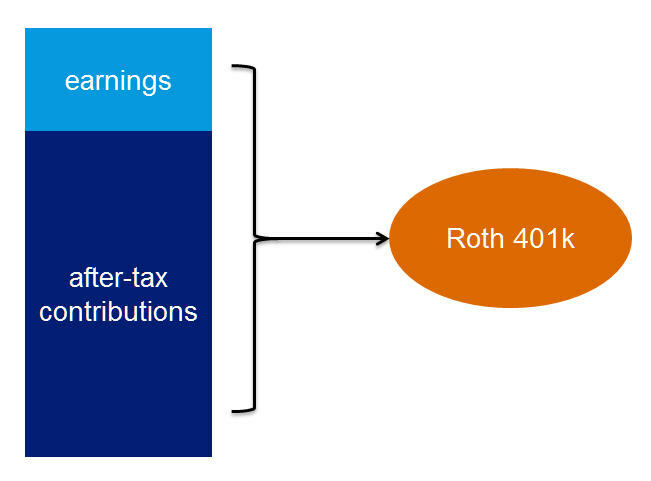 If the 401k plan also has a Roth 401k option, rolling over within the plan is easier. See The Elusive Mega Backdoor Roth. I have the MBR at my company’s 401k plan. Each paycheck I convert the after-tax contributions to my in-plan Roth Conversion the very next day. The plan segregates the 2018 and 2019 in-plan Roth conversions. I am 61 with a Roth IRA opened dozens of years ago. My question is: will I have to pay tax on already converted to Roth monies require that I pay tax on subsequent earnings if I rollover to an IRA before 5 years? Customer service seemed to think so. But that makes no sense. If the conversion is made, aren’t these funds now in Roth? I went from after tax sub account to a Roth ira last year with an in-service withdrawal and all went well no taxes since I did it right away. If you are doing an in service conversion to Roth 401k and “then” to an ira you pay taxes as a percentage of your full account value based on what is Roth and regular. There is no penalty with that as you go straight to another Roth account but you pay taxes on regular non-Roth earnings so remember the pro-rata rule. If your end goal is to a Roth IRA you must go from “after-tax” sub account > “Roth ira”. I can do that 4 times a year with my in service withdrawal rules. You don’t pay tax when you rollover the Roth account in your 401k to a Roth IRA. When you already established your Roth IRA more than 5 years ago and you are already 59-1/2, you don’t pay tax for withdrawals from the Roth IRA. Customer service isn’t a reliable source for tax questions. It’s not their job. My goal is to rollover the regular pre-tax to an IRA and the already converted in-plan Roth to a Roth IRA. So, my question is how to not pay tax on the earnings of the previously converted in-plan Roth funds. From my understanding the 5 year rule for a roll over starts fresh if you previously didn’t have a Roth IRA and it is a new account. You take a hit if you try to get it before 5 years. If the Roth IRA you are rolling into has already been open 5 years, I believe you are covered and the rest doesn’t apply. Some people will open a Roth IRA to start the clock while putting money in their 401k for the purpose of rolling it over later. The clock starts the day the account was opened I think. Thanks Harry and David. I opened my first Roth over 10 years ago and have one open now that received money from that original Roth. I totally agree that the customer service people are terrible at tax advice. She read to me from some boiler plate information. I might have an issue when I leave the company that the 401k provider might try to categorize it as a taxable distribution even though I plan to roll it over to my “aged” Roth IRA. But I’ll cross that bridge when I come to it. We are expecting layoffs here, possibly as early as September. I noticed that the 1099-R I received for my 2018 conversion of Roth from after-tax had a box for “taxable portion unknown” . I imagine that is for just these situations. Luckily, when I got money out, it allowed me to manually select “do not withold taxes” (it was automated) so I got a full check and it also had “taxable portion unknown” as you said. When taxes were finalized and the other entries were put in, it was finally reported properly and on my taxes the taxable portion was finally known by the IRS at that point. If it isn’t automated, definitely don’t trust customer service because they may screw you over. Good luck!